Emerging out of a decade of coalition military intervention in the Middle East and Afghanistan, the Australian Defense Force (ADF) is now focused on initiatives to engage the strategic Indo-Pacific region. 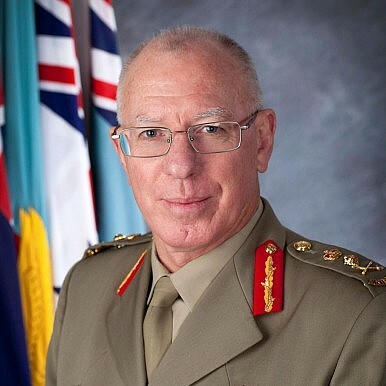 General David Hurley, the chief of the ADF, spoke to Australian military analyst Sergei DeSilva-Ranasinghe about defense cooperation with the United States, engagement with Asia-Pacific and South Pacific regions, the implementation of the Force Posture Review’s recommendations, initiatives to engage with the Indian Ocean region, and what Australia’s withdrawal from East Timor, Soloman Islands and Afghanistan ultimately means. What is the status of the ADF’s engagement with the United States and how are military-to-military ties likely to develop in the foreseeable future? General Hurley: There’s been a lot of commentary about our defense alliance with the United States. This is a relationship that’s been growing strongly for many years. It is very significant to Australia’s national security and defense capability, and we are always looking at ways to grow, strengthen and deepen that relationship. So when the United States was doing the Global Force Posture Review and wanted more frequent access to training areas in Australia, we were prepared to consider their request. The first company of Marines had a very successful tour of Australia this year. We will host the Marines again next year and then the government will consider the growth and size of any further US commitment. Similarly, the U.S. Air Force has conducted scoping studies to determine future cooperation, but essentially it boils down to more frequent access to bases in northern Australia, primarily Royal Australian Air Force (RAAF) Tindal. For Australia, more frequent or regular activity with U.S. forces through our training facilities gives us more opportunity to interact with them. In terms of interoperability, it is a sound testing opportunity. In terms of strategic engagement, it is already paying dividends in the sense that countries are reaching out to us and saying, “We’d like to conduct an activity with Australia and the U.S.” I think that the expanded engagement with the U.S. will only serve to increase the capability and capacity of the armed forces in the region to build confidence, and improve interaction. I do foresee a U.S.-Chinese-Australian exercise taking place in the future. It would be a good confidence building measure for the region. Tell us about the programs the ADF intends to implement as Australia also rebalances military-to-military programs in the Asia-Pacific? General Hurley: Our attention has been elsewhere over the last few years, and although we have been engaged in the region, we have not had many major exercises or trained in the Asia-Pacific region as frequently as we did before 2000. We are now re-establishing previous levels of engagement. This will give impetus to training opportunities not only with individual countries but also collective training on a bilateral, trilateral and multilateral basis. We have long standing and solid relationships with Thailand, Singapore and Malaysia and particularly with Singapore and Malaysia through the Five Power Defense Arrangement. Our relationship with China has improved over the last five to six years. We have had frank and beneficial discussions from the ministerial level downwards. Relations with Korea and Japan have also strengthened in the past couple of years. The Japanese Ground Defense Forces have come to Australia to participate in our Skill at Arms competition. This is a significant step forward in our ties with the Japanese from where they were even ten years ago, and there are some more good prospects in the future with the Japanese. Our military-to-military relationship with Indonesia across all three services is probably as strong as it was back in the mid-1990s. For the first time, this year we have Indonesian students representing every service at the senior college in Australia. We are planning to conduct a regional tabletop exercise with the U.S. Marine Corps and Indonesian National Armed Forces (TNI). The three nations are in talks about conducting another exercise in Indonesia next year, possibly with China as an observer. That’s quite exciting. I am very happy about the strong reciprocal relationship the ADF has with Indonesia. How is the ADF likely to strengthen its engagement with the South Pacific nations? General Hurley: As I said, the ADF has a strong reciprocal relationship with Indonesia. The same is true for Papua New Guinea and their Defense Chief. We cooperated very well in supporting the conduct of the recent national elections there, setting a good precedent for our ability to work together. We have also significantly increased the funding for our Defense Cooperation Program with Papua New Guinea this year and onwards to help them build their capabilities. Last November, I hosted the first ever meeting of the Chiefs of Defense from the southwest Pacific nations of New Zealand, Australia, Papua New Guinea, Tonga, and the senior French officer for Tahiti. These five nations will sit together and look at the southwest Pacific to make sure that we are getting the best out of the money each of us is contributing to developing capability, particularly in maritime patrol surveillance and response. Tell us how the recommendations of the Force Posture Review are likely to be considered and implemented? General Hurley: Some of the recommendations can be implemented fairly quickly while others need more time because they require significant capital investment. Many of the recommendations will be considered in the next White Paper. We will look to the 2013 White Paper to decide our future in terms of reduced operational tempo and increased interaction in the region. In relation to western Australia, there were concerns in the Force Posture Review that our presence was not as visible as it could be, so we will make our presence more noticeable in the north as an immediate response. There is already quite significant naval and air activity in northwest Australia but we are making ourselves more visible. We are planning to conduct our first exercise in northwest Australia in 2014. There are definitely major changes happening – if you look at the current generation of young people in the ADF, many of them have not exercised in the northern part of Australia like we did in the 1980s and the 1990s, so developing that sort of experience and knowledge is something worth pursuing. Given the increased global and strategic importance of the Indian Ocean, how is the ADF likely to engage the region? General Hurley: In a number of public presentations and lectures that the Defense Minister Stephen Smith and myself, as well as others in the Department, have given in recent months, we have been referring to what we call the “Indo-Pacific Strategic System,” an area that we see as one strategic system. Given the many commonalities of interest in the broad region from the east coast of Africa and the Persian Gulf to the Indian Ocean and the Western Pacific, particularly the trade routes, we are teasing out that idea in the White Paper and examining what it means in terms of expressing our strategic requirements and interests into the future. The Indian Ocean is certainly very important to the ADF, to Australia and to the countries on its periphery, particularly for the maintenance of a secure trade system and the growth of economic prosperity. Historically, we have focused on Southeast Asia and the archipelago, and northwards and eastwards; now we want to reorient further to the west. We have always had good relations with our neighbors in the Indian Ocean, so we are coming from a good base. We are looking at building on multilateral forums such as the Indian Ocean Naval Symposium and the Indian Ocean Rim-Association for Regional Cooperation (IOR-ARC). It is too early to know whether other nations agree, but it would be a step forward if we could perhaps address common interests and work cooperatively on these forums. We have a very good working relationship with Pakistan – after the United States, Australia is the second-largest provider of individual training to Pakistan. We also help Pakistan with counterinsurgency training. We do have naval interaction with Sri Lanka. It’s a modest but good relationship. We do not have much interaction with Nepal and Bangladesh at the moment, but they may come into play as we shift more of our attention to the Indian Ocean. Although we don’t have the resources to be everywhere, the ADF is also working with the African Union (AU) through the East Brigade. We have established teams to help the Ugandans prepare for counterinsurgency operations in Somalia, command and control at brigade level, and to support Peacekeeping Centers. We have also sent a Defense Attaché to the AU to build on our interaction. South Africa is and will continue to be important. We have service-to-service contacts and discussions with South Africa. It is also a modest relationship but we are mindful of where it might take us in the future. What is the likely ADF deployment posture after Australia’s winds down from East Timor, the Soloman Islands and Afghanistan? With more troops available will the ADF participate in more in UN operations? General Hurley: This is a conversation I have with members of the Australian Defense Force (ADF) when I travel around and talk to them. I point out to them the significant changes in the operational tempo for the ADF in the next three to four years. We know we will draw down in Afghanistan and cease operations in East Timor and the Solomon Islands. So what do we do when the operational tempo reduces? We have to reset the ADF to do what it does extremely well – be prepared to respond to the government’s requirements to deploy whenever required. However, it is possible the ADF will participate in future UN operations – but we will need to consider our national interest in such operations and the ADF’s role in them. I don’t see the ADF providing long-term infantry support to UN operations. Our Army, for example, is of more value to the UN in the concept development of peacekeeping doctrine, and training and mentoring local troops and citizens at peacekeeping rather than performing the day-to-day foot soldier work. The Australian government has announced the withdrawal of Australian troops from Afghanistan by 2014. How will it take place at the operational and strategic level, and what will be Australia’s likely role after 2014? General Hurley: At the strategic level, the government has committed to support Afghanistan in its governance, development and aid programs, and the Afghan National Security Forces (ANSF) after 2014. So, the withdrawal from Afghanistan is not a withdrawal in the sense that we will go from where we are today to nothing. It is a transition to a new operation – one that the government is considering, but has not yet signed off on. So we’re moving from our current force structure in Afghanistan to advisory forces, providing enablers and command and control. We will have handed over to the Afghans by this time next year and we’ll gradually reduce our numbers in Afghanistan until we transition into the post-2014 force, again pending government’s decision. This is a conventional transition. As we meet each of our milestones with the ANSF in handing over the conduct and lead for operations, we will step back from the lower levels of mentoring to higher levels at brigade and corps. This will reduce the need to place our troops and mentors on the ground, leaving us to continue special operations efforts which are critical in the sense of providing risk mitigation until the end of 2014. We may also reposition our forces in Afghanistan for any operations after 2014. Sergei DeSilva-Ranasinghe is a security analyst and a visiting fellow at the National Security Institute, University of Canberra.